This adorable Mother’s Day craft make a great gift for that special person in a child’s life. It’s cute and easy to make. Special bonus….it will last a lot longer than a real bouquet. 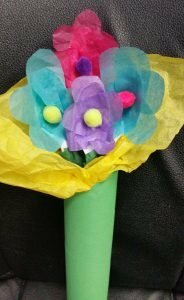 Follow the step-by-step directions below to make your very own plastic spoon Mother’s Day bouquet. Step 1: First take a sheet of tissue paper and cut it into four pieces (I used the large tissue paper sheets, the same used when adding tissue paper to a gift bag.). Take one square and fold it a couple of times until it is in the shape of a small square. Starting at the folded edge of the paper, cut out a U shape. This will be your flower petals. Step 2: Take a small strip of green tissue paper and wrap it around your spoon handle. Secure the tissue paper with a piece of tape. This will be the green stem. Step 3: Glue your “flower petals around the spoon. Glue a pom-pom in the middle. Step4: Repeat step 2 and 3 until you get the desired amount of flowers for your bouquet. Step 5: Using a piece of construction paper, start at one corner and roll. Secure the end with a piece of tape. This will hold your flowers. Step 6: Place one square of tissue paper inside bouquet. This will hold the spoons in place. Step 7: Place the flower spoons inside the tissue paper, and push down.